Adnans Pro Blog - Cyclocross Basics Part 1. Adnan's Pro Blog - Cyclocross Basics Part 1. Cyclocross is a blast. Here's how to get started. Summer is fading into a warm memory and fall is here. What’s a rider to do? Cyclocross, of course! If you are not familiar with cyclocross (CX for short), it is a type of bike racing that features a course with mixed terrain like pavement, dirt trails, grass, steep hills and random obstacles. The obstacles sometimes require a rider to dismount, navigate the tricky section and then jump back on the bike. 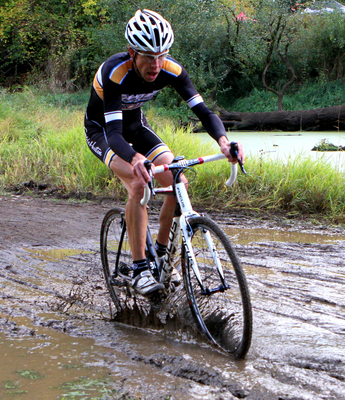 Cyclocross races are usually run in laps with most races lasting for 30-60 minutes. You can check out a sample CX race here. It is crazy fun and addicting. The atmosphere has been compared to party with bikes! Cyclocross is really all about bike handling. Although there is no substitute for hands on coaching for cyclocross technique and on bike practice, I thought I would outline some of the basics you need to consider. Also, VeloPro has great training plans for cyclocross races. So, if you haven’t signed up, give us a try. A properly fitted CX bike should feel a bit different than your (properly fitted) road bike. Individual fit is very specific, and the following will not apply to everyone. It's best to find a qualified fitter in your area and have that person do a specific fit for your CX bike. That said, your CX bike's saddle will likely be a bit forward compared to your road bike. The height, however, should be the same from the pedal to the saddle top, accounting for the difference in shoe and pedal systems. Next, check your handlebars. Some riders prefer the same reach as on their road bikes, but with a saddle/handlebar drop that is less than on a road bike. Others like a shorter reach with the same drop, or a bit less. It depends a bit on your flexibility as well as on the bike itself. If you're not positioned on the bike the way it is designed for you to be, it won't handle optimally. Finally, since a lot of time is spent on the brake levers in 'cross, many riders run their bars and/or brake levers a tilted slightly more upward than on their road bikes. I prefer to do this as well, but I also run compact bars so the drops are not simply along for the ride. See the picture with this blog for my setup. Remember always to stay relaxed! This is the golden rule for all good bike handling. For these corners, brake and pedal at the same time. This sounds a bit silly, but the idea is to keep drive to the rear wheel so that it "pushes" you around the corner. The brakes counter the drive and together they help you balance. Brake early in slippery conditions so that you don't lock up your wheels on the approach to the corner. Make sure to keep the power on from about 1/4 of the way through the turn. Lean the bike instead of steering it. When the front-end slides, keeping the power on will bring the bike back into line. RELAX and have confidence in your bike. It's designed to get you out of trouble, so let it. It is good to practice this in deep, loose gravel (remember, SLOW speed). Once you get used to the front wheel sliding a bit, it won't seem so scary. Very similar to the road - relax your arms, stay low, lean and counter steer a bit. Keep your weight low and push downward on your outside leg, which should be at the bottom of the pedal stroke. Trust your tires and don't be afraid of a little sliding around. Relax. If you are using VeloPro to train for cyclocross, you have both endurance and intervals built into your plan! To be successful, you need a nice endurance foundation for day-to-day recovery. Then you can max your performance potential with intervals. On this foundation you can build the House of Cross. It's not a church, but with weekly attendance, each Sunday your competition will kneel before the altar of your awesomeness. If you are racing on Saturdays (and I encourage you to, since they are often low-key and casual), go hard on Tuesday and Wednesday and take Thursday completely off. You can structure your plan this way in VeloPro by marking Thursdays off. This may change depending on your individual qualities of recovery and training load capability, but this is a good place to start.